Leading Chinese international companies are actively developing corporate citizenship efforts as they expand their global footprint, according to the report released in 2012 by the World Economic Forum. Prepared in partnership with The Boston Consulting Group (BCG) and titled Emerging Best Practices of Chinese Globalizers: The Corporate Global Citizenship Challenge, the report gives examples of how Chinese globalizers are aligning their profits with real and lasting contributions to the local communities in which they operate. 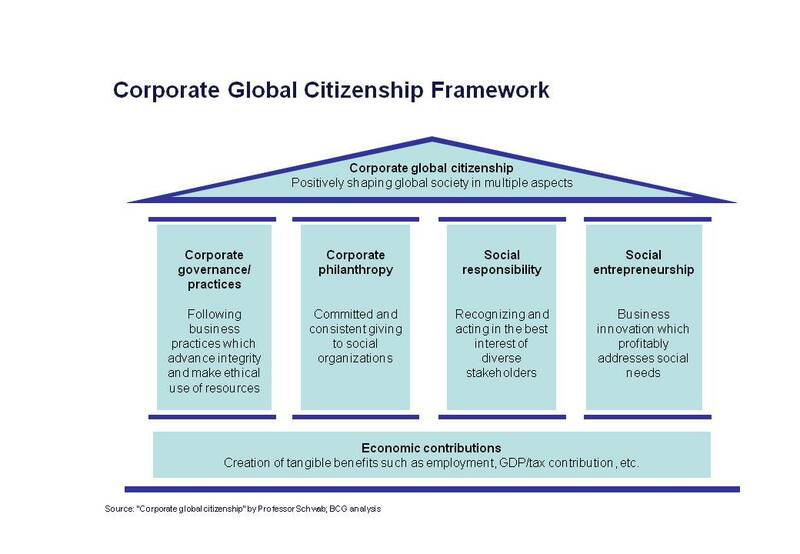 The concept of corporate global citizenship as introduced by Klaus Schwab, Founder and Executive Chairman of the World Economic Forum, advocates that companies engage with other stakeholders to improve the society in which they operate. Elements include ethical corporate governance, philanthropy and corporate social responsibility, as well as an emerging element: corporate social entrepreneurship, that is, the integration of socially responsible principles and ideas into products of commercial value. 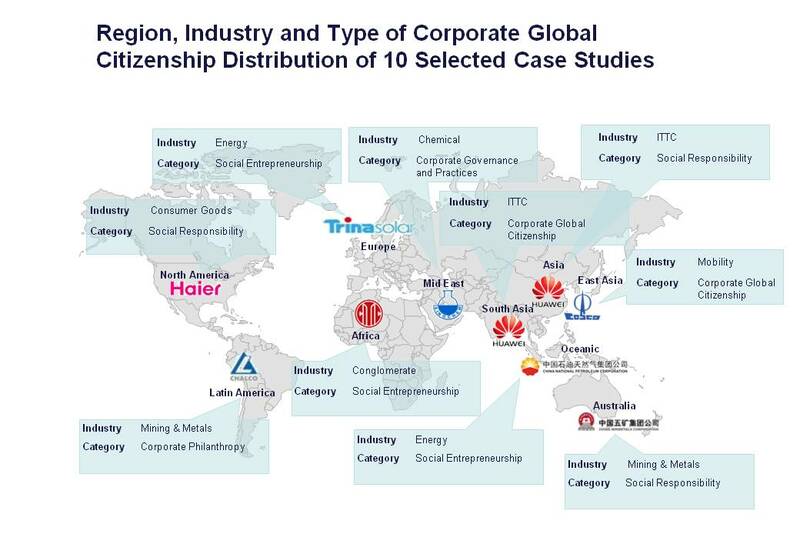 Over the past 10 months, the report’s research team reviewed the corporate citizenship-related reports of 95 Chinese companies with large overseas operations and talked to 130 senior executives, researchers and corporate citizenship experts. All companies face challenges as they become international. However, instead of focusing on shortcomings, this study focuses on emerging best practices. 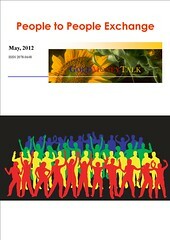 Ten outstanding case studies were selected and featured in the final report. The selected best practices from across the continents of Asia, Africa, Europe and Latin America, and encompass a range of activities such as employment-related practices, supply chain management, green technology, community engagement and peer cooperation. For example, one Chinese information and communications technology (ICT) company recruited local housewives – a non-traditional work force – as “phone ladies” in a remote area of Bangladesh. This initiative enabled local women to be gainfully employed while mobile coverage in the region increased. Under the “Go Global” policy, China has become the world’s fifth-biggest outbound-foreign-direct investor. “As Chinese globalizers play a greater role in shaping global business, it is encouraging to find examples of innovative and effective approaches to corporate global citizenship,” said Christoph Nettesheim, a Beijing-based senior partner at BCG. Recognizing the cultural and societal differences in the process of internationalization, the report also points out key challenges and provides practical recommendations for Chinese companies which are still midway on the journey towards fulfilling their future corporate global citizenship. Some Chinese companies lack a sufficiently broad and thorough understanding of what corporate citizenship means. They assume it must be purely altruistic, but this implies a zero-sum trade-off in which communities benefit at the expense of shareholders. Instead, corporate global-citizenship ventures should align their business goals with social problems. Some Chinese companies are notably reluctant to communicate, such as in disclosing balanced citizenship information to the public, discussing corporate plans with external stakeholders, and demonstrating trust to local partners. A more open discussion and fuller partnership would help companies strengthen critical relationships that result in better outcomes for them and their communities. Chinese companies need to become better innovators of corporate citizenship practices. In the 30 years since economic reform, many of them have succeeded by following the well-established practices of Western companies. However, to become true corporate global citizens, Chinese companies must develop their own creative solutions as well as learn from the experiences of others. “We hope this report helps the global community better understand Chinese companies’ progress on corporate global citizenship, as well as domestic changes in China that have led to greater focus on this effort,” said Nettesheim. “We hope to promote dialogue on corporate global citizenship among the Chinese business community, but also to share the findings of this report with other new players from emerging markets who plan to expand their business around the world,” said Greenhill.